The Institute for Advanced Computational Science is housed in the IACS building, right next to the Life Sciences building. Our 4-digit zip is 5250. From Penn Station in Manhattan, take the Long Island Rail Road’s Port Jefferson line to Stony Brook Station ( http://lirr42.mta.info/). There is a campus bus that picks you up at the train station and will take you to the Life Sciences stop, which is just east of the IACS building. Driving Directions: Exit the airport and turn left onto Veterans Memorial Highway (Route 454 West). Merge onto Sunrise Highway (Route 27) and take the second exit onto Nicolls Road. Drive north for 12 miles. The north entrance to the University is on the left. Public Transportation: Take Suffolk County bus S57 to the Smith Haven Mall. Change buses at Smith Haven to S60 or S69 to Stony Brook University. This bus line also services Port Jefferson Village. Driving Directions: From the Van Wyck Expressway (I-678N), take exit 1 for the Belt Pkwy E. towards Eastern Long Island. Merge onto the Belt Pkwy/Shore Pkwy W. Continue on Southern State Parkway E. Take exit 28AN to NY 135-N towards Syosset. Take exit 12E for Northern State Parkway E towards Hauppauge. Merge onto I-495 and follow the “By Car”directions above to Stony Brook University. Public Transportation: Take the Air Train from JFK to the Long Island Rail Road - Jamaica Station ( http://lirr42.mta.info). At Jamaica Station, board a Port Jefferson bound train. Exit the train at Stony Brook Station. Driving Directions: Take the ramp onto the Grand Central Parkway, then take exit 10E-10W towards I-495/Long Island Expressway/Manhattan/Eastern Long Island. Take exit 10E towards Riverhead and merge on to I-495. Follow the “By Car”directions above from I-495 to Stony Brook University. Public Transportation: It is difficult to reach Stony Brook University from LaGuardia airport using public transportation. You can take a taxi from LaGuardia to the Long Island Rail Road, Jamaica Station. This should cost between $20-$30. Once at Jamaica Station, board a Port Jefferson bound train and exit at Stony Brook Station. Driving Directions: Take US-9 from the airport, then keep right at the fork towards I- 95N. Merge on to I-95N towards US-46/Lincoln Tunnel. Take exit 16E towards the Lincoln Tunnel and merge onto NJ-495E. Continue through the Lincoln Tunnel and exit towards Dyer Avenue. Turn right on Dyer and left on W 34th Street. Turn left onto Tunnel Entrance Street and continue on I-495E. 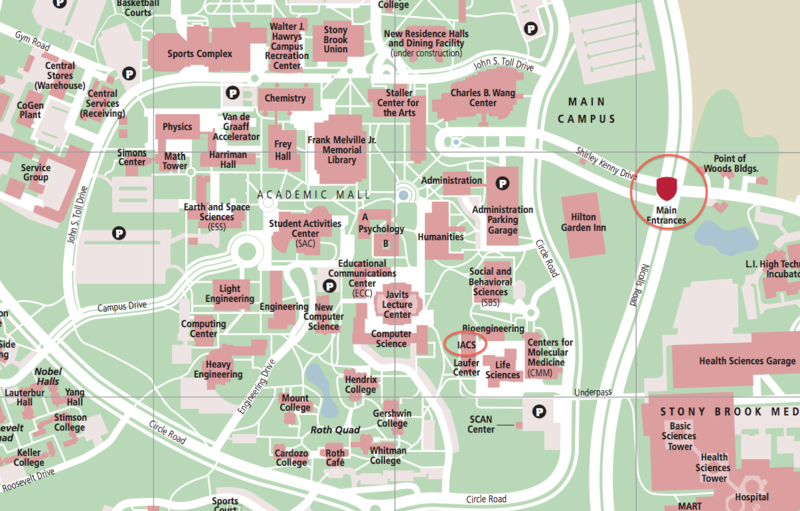 Follow the “By Car” directions above to get to Stony Brook University. Public Transportation: Take the Air Train to the New Jersey Transit ( www.panynj.gov/airports/ewr-to-from.html), then take the New Jersey Transit to Penn Station ( www.njtransit.com/). Once at Penn Station, board a Port Jefferson bound Long Island Rail Road train ( http://lirr42.mta.info). Exit at Stony Brook Station.